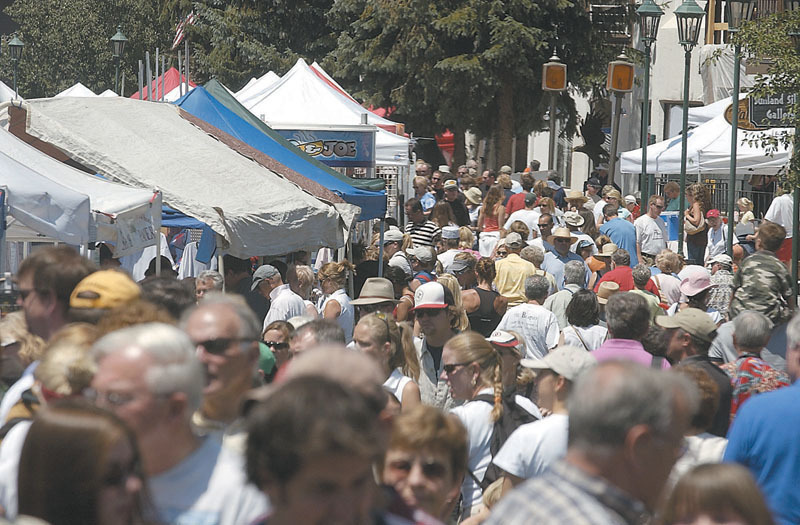 VAIL, Colorado – With just 20 tents in 2001, to more than 125 tents this year, organizers say the Vail Farmers’ Market and Art Show has grown into Colorado’s largest farmers’ market in less than a decade. Founders Jon Staufer and Rick Scalpello got together nine years ago to try to think of ways to bring more pedestrians to Meadow Drive, a part of Vail Village that was behaving more like a side street in the late 1990s and early 2000s. Scalpello, who no longer runs the Vail market but runs the Edwards Farmers’ Market, said Staufer had tried to get a farmers market going a couple of years earlier without any support, so they tried again. The 20 tents that first year were about 20 feet apart, and as the market added more vendors and entertainment to the mix each year, the tents got closer and closer. “Now there’s 125 tents, six inches apart,” Scalpello said. The reason for the popularity of the Vail Farmers’ Market is simple, Scalpello said. “We’ve got something that no other market has – Vail,” he said. Scalpello said the Meadow Drive Partnership, the not-for-profit organization that puts on the market, estimates that about three-quarters of the visitors are tourists. Advertisements run in newspapers and on radio stations practically all over the state, Scalpello said. Organizers are also pretty sure based on visits and from word of mouth that the Vail Farmers’ Market is larger than the Cherry Creek Farmers’ Market in Denver and the Boulder Farmers’ Market – the only two markets that could compare to Vail in size – which is why the Vail market claims it is the largest in the state. The original goal to stimulate business in Vail, and specifically along Meadow Drive, has worked wonders. Marc Levarn, president of the Meadow Drive Partnership and owner of the Vail International Gallery, has worked on Meadow Drive since 1995 and said there’s no comparison between the amount of business now to the amount back then. In addition to a beautiful backdrop of Vail and the surrounding mountains, the Vail Farmers’ Market boasts a lot more than just produce. In fact, sometimes market vendors and organizers hear criticism for not having enough produce, said Sybill Navas, the town’s Commission on Special Events administrator. But with tourists making up the majority of the market’s visitors, they’re likely not looking to buy produce, she said. Angela Mueller, director of the market, said the market has become more about entertainment, family activities and the food. In just one afternoon, visitors can browse through various art and photography, buy some Colorado peaches, taste Colorado cherry juices and ciders, eat a barbecue brisket sandwich, taste Colorado wines and browse through homemade jewelry. What the festival might lack in products that traditional farmers’ markets offer it makes up for with its variety, Mueller said. Navas said organizers have done very well in terms of creating a festival atmosphere in Vail. Levarn said there’s a common saying around that the Vail Farmers’ Market is like having a Sunday powder day in the summertime, where everyone stays in town rather than heading up to the mountain. “We just love to see Vail busy,” Levarn said. And while the original intent was to revitalize Meadow Drive, the entire town has reaped the benefits from the market, said Marty Stewart, the market’s operations manager. Scalpello said Stewart is the man behind the scenes who really makes the market happen. Stewart starts working on getting the market ready at 6:15 a.m. every Sunday. There’s absolutely nothing on the streets when he arrives, he said.